Coordinates: 21°0′22″N 105°47′13″E﻿ / ﻿21.00611°N 105.78694°E﻿ / 21.00611; 105.78694 The Vietnam National Convention Center is a major convention center located on Thăng Long Boulevard in Nam Từ Liêm district of Hanoi, Vietnam. The convention center was designed by Meinhard von Gerkan and Nikolaus Goetze of Gerkan, Marg and Partners. Meinhard von Gerkan, who previously designed the Vietnamese National Assembly building, was assigned to design the Vietnam National Convention Center. Four designs were presented for consideration in April 2004. In the end, a design called "Surfing the East Sea" was unanimously chosen as the official design of the project by a panel of 31 Vietnamese architects. The design of the center takes inspirations from Hạ Long Bay, a World Heritage Site in Quảng Ninh Province, Vietnam. The building's wave-shaped roof is made from steel, heightened to 53.25 m (174.7 ft) over the main meeting hall. The main structure has a dimension of 215.25 m (706.2 ft) in length and 113.5 m (372 ft) in width. Vietnam National Convention Center is the largest convention center in Vietnam by area, covering an area of 64 ha (160 acres). This complex includes a public square, a helipad, an on-ground and underground parking lot of 1,100 parking spaces, residential area and landscaping features. The core convention center itself has a gross floor space of 65,000 m2 (700,000 sq ft). It is equipped with solar power panels as a back-up energy source. The Military Honour Guard Battalion of the Vietnam People's Army conducting a troop review at the convention center during the opening ceremony of the 16th ASEAN Summit in 2010. Many entertainment and exhibition events were also held at VNCC. Multiple international artists including 2NE1, Boys Like Girls, Kenny G, Kelly Rowland or Lenka have performed here. ^ a b c Khiết Hưng. ""Sóng" biển Đông giữa lòng Hà Nội". Tuổi Trẻ Online (in Vietnamese). Retrieved 30 April 2018. ^ "NCC-Eng" (PDF). Inros Lacker AG. Retrieved 30 April 2018. ^ "Phòng khánh tiết". Vietnam National Convention Center (in Vietnamese). Retrieved 30 April 2018. ^ "Khám phá tòa nhà Trung Tâm Hội Nghị Quốc Gia Hà Nội". Designs.vn (in Vietnamese). Retrieved 30 April 2018. 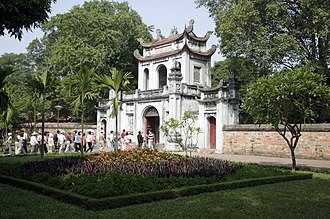 Wikimedia Commons has media related to Category:Vietnam National Convention Center. 2NE1 was a South Korean girl group formed by YG Entertainment in 2009. First appearing in Lollipop, a campaign with Big Bang for LG Electronics. Since then, the group has released two extended plays, 2NE1 and 2NE1, and two studio albums, To Anyone and Crush. Their first EP spawned the number-one single I Dont Care, which won them the Song of the Year award at the 2009 Mnet Asian Music Awards. 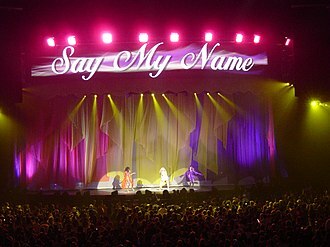 Their follow-up singles, such as Go Away, Lonely and I Am the Best, were similarly successful, 2NE1 officially debuted in Japan in September 2011 with a Japanese version of their second EP, titled Nolza. Since then, the group has released one album, Collection. In 2012, The New York Times named 2NE1s performance at the Prudential Center in New Jersey as one of the Best Concerts of 2012, in October 2012, Zack Greenburg of Forbes magazine noted that 2NE1 has sold 27 million digital downloads. The youngest member, officially left the group on April 5,2016 and it was revealed that although CL and Dara would remain signed to YG Entertainment, Park Bom did not have her contract renewed. Their final single Good Bye was released on January 21,2017, 2NE1 was first mentioned by South Korean press in late 2004. Both Spicas Bohyung and Fiestars Linzy were trainees alongside the 2NE1 members, they were eliminated before debut. YG Entertainment formally announced in early 2009 that the group would consist of four members, the company stated that the group had trained for four years, and that their debut album would contain songs produced by 1TYMs leader Teddy Park. The groups name was announced as 21, due to the discovery of a singer with the same name. The name, pronounced in Korean to approximate English as To Anyone or Twenty One, combines the phrases 21st century, in collaboration with Big Bang, 2NE1s first CF song, was digitally released on March 27,2009. The song was created for LG to promote their Cyon phone, the music video was released on March 28. Lollipop was not a single because it was an advertisement. 2NE1s debut song, was released on May 6, the song was written and produced by 1TYMs Teddy Park, and contained elements of hip-hop and reggae. 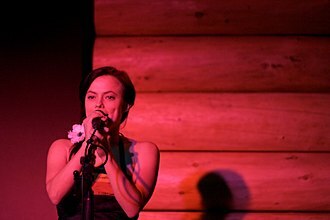 Lenka is an Australian singer and actress best known for her song The Show, from her self-titled album Lenka. The track was used in the 2011 film Moneyball and her song Everything at Once was used in a Windows 8 television advertisement and in a Disney Movie Rewards commercial. 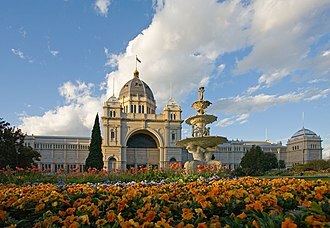 As a teenager, Lenka studied acting at the Australian Theatre For Young People, Lenka starred in the Australian ABC-TV drama series GP as Vesna Kapek in the 1990s. She hosted Cheez TV and has guest starred in other Australian TV series, including Home and Away, Wild Side, Head Start and she appeared in Australian feature films The Dish and Lost Things, as well as in theatre productions. 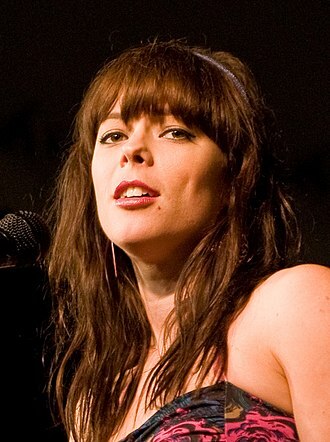 Lenka provided the vocals for 2 tracks on Paul Macs 2005 album, as Lenka Kripac, she was a member of the Australian electronic-rock crossover band Decoder Ring for two of their albums. She moved to California in 2007, after adopting her first name as her sole artistic name, Lenka released her eponymous debut album on 24 September 2008, with The Show chosen to be the first single release from the set. The Red River, known as the Hồng Hà and Sông Cái in Vietnamese and the Yuan River in Chinese, is a river that flows from Yunnan in Southwest China through northern Vietnam to the Gulf of Tonkin. According to C. Michael Hogan, the associated Red River Fault was instrumental in forming the entire South China Sea at least as early as 37 million years before present, the Red River begins in Chinas Yunnan province in the mountains south of Dali. It flows generally southeastward, passing through Dai ethnic minority areas before leaving China through Yunnans Honghe Autonomous Prefecture and it enters Vietnam at Lào Cai Province. It forms a portion of the border between China and Vietnam. The river, known as Thao River for this upper stretch and its main tributaries, the Black River and Lô River join in to form the very broad Hồng near Việt Trì, Phu Tho Province. Downstream from Việt Trì, the river and its many distributaries spread out to form the Red River Delta, the Red River flows past the Vietnamese capital Hanoi before emptying into the Gulf of Tonkin. The reddish-brown heavily silt-laden water gives the river its name, the red river has a reddish-brown tint to the river because of the silt. The Red River is notorious for its violent floods with its seasonally wide volume fluctuations, the delta is a major agricultural area of Vietnam with vast area devoted to rice. The land is protected by a network of dikes and levees. The Black River and Lô River are the Red Rivers two chief tributaries, in the 19th century, the Red River was thought to be a lucrative trade route to China. 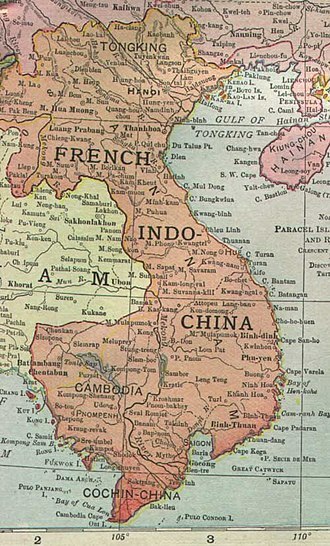 The late 19th-century French explorers were able to travel up the Red River until Manhao in South Yunnan, the Red River remained the main commercial travel route between the French Indochina and Yunnan until the opening of the Kunming–Hai Phong Railway in 1910. Thanks to the river, Hai Phong was in the early 20th century the sea port most easily accessible from Kunming, one of the earliest of them is the Thác Bà Dam in Vietnam, constructed in 1972, which forms the Thác Bà Lake. A Đông Sơn bronze drum, c.800 BC.